You gotta be kiddin’ me?! Zechariah was an old man. A priest, yes, but old. Elizabeth, his wife of decades, must not have been far behind. She had been barren as a young woman. Now she was well passed child bearing age. No children had been born to them. No children would be born to them. So everyone thought. God works in can’t and won’t. God overwhelms impossible and never. God loves the space between reasonable and unreasonable. God excels at reaching beyond possible into the impossible. God inhabits the realm beyond nature, the supernatural. When God promises. You can trust it. You can count on Him. He is God. He is Sovereign. He can do what He wants. Zechariah is burning incense before God in the Temple. You can read this in Luke 1:5 and following. The archangel Gabriel appears. Awesome bunch angels are. They have to skip, “Hello,” and move straight to “Do not be afraid.” Gabriel tells Zechariah that Elizabeth will have a boy. A boy to be named John meaning “God has been gracious.” Oh, yes, in spite of decades of barrenness God had a special, gracious plan. A miraculous plan. John will be a powerful prophet like unto Elijah. 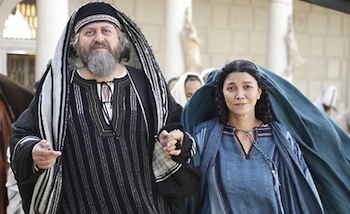 Preparing the way for the Messiah will be John’s calling. Generally, we can agree to the aphorism that “no question is a dumb question,” but I wonder if we need an exemption for questions asked in disbelief of God’s Sovereign will? Our amended rule, not so succinct, would be something like this, “No question is dumb, unless God clearly says something to you and you just as clearly think God can not do it. You’ve just called God a liar. You are in BIG trouble now, Buddy.” That’s the new rule. We’ll call it The Big Trouble Disbelief Rule. You’d do well to follow it. Unless you wanna end up like Zachariah. Gabriel shut him up for nine-plus months. No speech. Read Luke 1:19-20. It wasn’t until John was born and taken to be circumcised on the eighth day that Zechariah’s tongue was loosed says Luke 1:64. When Zechariah offers his amazing praying in song, the Benedictus recorded in Luke 1:68-79, he connects it with the miraculous baby-boy bearing promise of a Sovereign God from verse 13. Zechariah offers an expectant prayer. Expectant of the Messiah. Expectant of his own miraculous son’s role as the forerunner prophet. Expectant prayers begin with God’s promise. Not hopes. Nor wishes. Not even dreams. But God’s promise. God announced through the angel Gabriel that Zechariah and Elizabeth would have a son. They did have a son. What is impossible in your life? Who do you think will never change? What do you think can’t happen? That is exactly where God likes to show up. Seek His will. Pray in expectation of His answer. What has God announced for you? Act in faith as He guides you. Find God’s promises for you. Live in all the He has for you. Read or listen to this Scripture from Luke 1 in YouVersion. This post is based on the second sermon in my series, The Prayers of Christmas. You can hear the podcast here or subscribe on iTunes.